The bride and bridesmaids in this photo had elected to get ready in separate rooms so that all the bride’s best friends would not see her till she was completely ready. All the bridesmaids were quite excited which can be easily seen by the young maid of honor in the middle of the picture as she holds her hand in front of her face in awe of her best friends beauty on her wedding day. This was one of my favorite photographs created during the wedding day at the end of getting ready. The location was island hotel in Orange County, which is a beautiful modern venue for weddings. The island hotel is located in Newport Beach, making it an ideal location for wedding photography in central OC, it is near Laguna Beach or Huntington Beach, and Newport Harbor. However this family elected to get married outside the hotel at a different location so we just utilized a suite on the top floor for bridal portraits and candid images. My favorite aspect of this photo is the expressions and the moment. 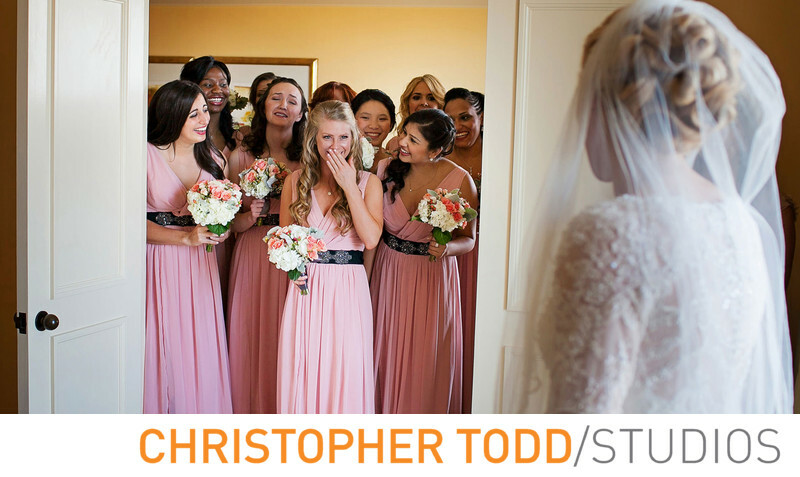 I also love that you can't see the bride's face, adding a little mystery to the image and definitely suggesting that it could be any bride getting this reaction from their bridesmaids. The bride's gown his full sleeves made of lace. She also wears a cathedral veil with an up hairstyle which was quite trendy when she was married. The bridesmaids are wearing long pink gowns with black sashes and black high heels. Location: 690 Newport Center Dr, Newport Beach, CA 92660. 1/160; f/2.8; ISO 200; 35.0 mm.